SP Cashbag is a 300mm length, pull tight, bag security seal, featuring integral gripping spikes and a side tear off, manual release mechanism. Suitable for use with many types of bags or sacks, it is available in boxes of one thousand seals with optional custom laser marking of name/code and sequential numbering and delivery within 5-10 working days. Place your order below now and if you choose a customised version we will contact you shortly, to discuss your print requirements. 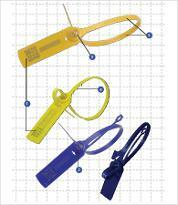 300mm length, polypropylene bag security seals. 6mm width, with optional custom laser marking. Stock version, 1,000 seals @ £110.00 per box excl VAT. Customised, 1,000 seals @ £120.00 per box excl VAT. * Please note, these products are only available to purchase online, for UK mainland customers. If you wish to purchase from outside this area please do not hesitate to CONTACT US FOR A RAPID QUOTATION. Price exclude VAT & carriage which is added at checkout. Do you need tech specs, a smaller quantity or bar coding ?